KVS Various teaching posts, principal exam admit card 2018 released. Here’s how to download Admit card. 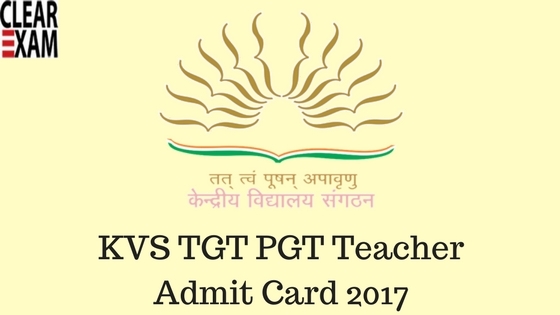 KVS PGT, TGT, PRT Principal Exam, admit card of 2018, KVS 2018 admit cards, Kendriya Vidyalaya Sangathan admit cards, KVS admit card 2018, KVS Latest admit card. Kendriya Vidyalaya Sangathan has released the admit cards for the PGT, TGT, Principal, Vice-principal, librarian recruitment exam 2018 on their official website. The candidates, who have applied for various teaching posts can go through the official website www.kvsangathan.nic.in to download admit cards. Only B.Ed. qualified candidates can apply for the exam. The exams will be conducted in the month of November & December in different sessions morning(10 am to 12:30pm, 09:00 am to 11:30 am) and afternoon ( 12:30 pm to 03:00 pm, 02:00 pm to 04:30 pm), evening (04:00 pm to 06:30pm). The steps to download KVS PGT, TGT, and Principal exam admit card 2018. 2. Click on the link ' click here to download admit card for the post of principal & vice-principal'. 3. Candidate will be directed to 'cbseitems.nic.in'. Click on login tab present on top. 4. Enter the details including registration number, date of birth. Then click log in. 5. Admit card will appear on the screen. Take a print out for further reference. It is to inform that KVS vice Principal & Principal Exam is to be held on 03/11/2018.in morning & afternoon shifts, candidates are advised to check on the portal regularly for getting notification regarding Admit Card & for All other Posts Exam Notice. By providing valid Credentials candidates will be able to download Admit Card. Candidates are suggested to prepare well for the exams as only one month is left for the preparation. We wish all the very best to all candidates. Candidates can download their Admit Card from official website of Kendriya vidyalaya Sangathan. 1. To download KVS Principal & vice Principal Admit Card, candidates are suggested to go to the important link section of official website of Kendriya Vidyalaya Sangathan. 2. After going through the link candidates need to click it to download KVS Principal & vice Principal Admit Card. 4. After providing these details correctly, candidates will be able to download KVS Principal & vice Principal Admit Card.